Tamworth Castle with its well preserved multi-angled keep, has stood high on a mound overlooking the River Tame since the late 12th century. The castle was first constructed in 913 AD by Alfred the Great's daughter then later, William the Conqueror, after his Norman Conquest, gave the land to his supporter Robert De Marmion who set about building the keep and curtain walls visible today. The middle room of the Norman tower is known as the ghost room and in it, a ghostly Nun has been sighted. She is known as the black lady of Tamworth. Apparently this goes back to when De Marmion expelled the nuns from the nearby convent at Polesworth when he built the castle. 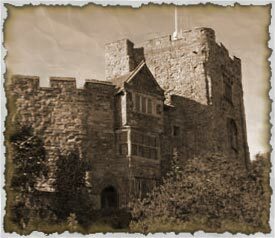 There are many ghostly happenings in this great castle which have long been without explanation but the most famous ghosts associated with the castle are the Black Lady and the White Lady. The story goes that the White Lady was captured and locked in the Tower by the wicked Sir Tarquin. But after a while she fell in love with him and is said to walk the battlements around the castle, weeping over her lover - slain by Sir Lancelot du Lac, who came to rescue her. Apparently the White Lady threw herself from the battlements when she found that Sir Tarquin was dead. Her ghost has often been seen walking the Battlements and her mournful cries heard. The Black Lady is supposedly the ghost of a nun called Editha who founded her order in the 9th century. The nuns were said to have been expelled from their Convent by Robert de Marmion. The nuns in their angry prayers were said to have called Editha from beyond the grave. Legend has it that one night in 1139 AD after a lavish banquet, Marmion was attacked by Edithas ghost, who warned him that unless the nuns were restored their convent, the Baron would meet an untimely death. Just before she vanished the spectre hit the Baron on the side with the point of her crosier; the wound was so terrible that Marmion's cries awoke the whole Castle. His pain only ceased when this vow was taken and the nuns returned to Polesworth.